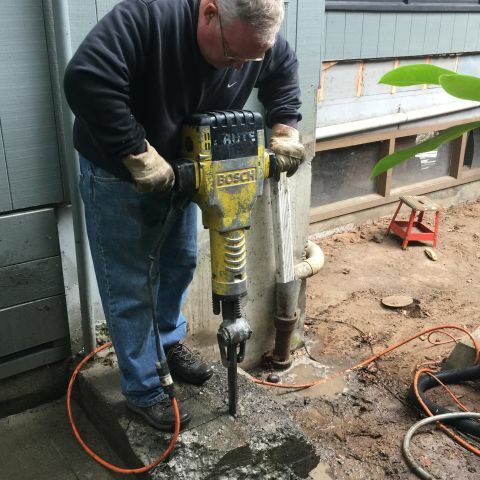 You're renting a 60-pound breaker hammer to do serious damage to concrete. Imagine what it can do when that power is turned against you -- Don't even consider getting near a breaker hammer without safety protection. It's tough to say what form of personal protection equipment is most important when using a jackhammer, but we'll start with heavy work boots, because all it would take is one or two seconds of contact between your foot and the jackhammer "bit" to cause an injury. After that, it's a toss-up between eye and ear protection. Bits of concrete, rock, asphalt and dust go flying whenever you use a jackhammer. Safety glasses are essential! Hearing damage is little less tangible, but a real threat. We recommend over-the-ear "muffs" when using a jackhammer. After that come gloves and long pants -- but you weren't really thinking about wearing shorts while using a jackhammer, were you..? Jackhammers are great on their own, and concrete saws are great on their own. But put them together, and you can really get some work done. One, it makes the hammering easier, essentially by cutting four-plus inches into the surface. Two, it sets a definable edge and helps you manage the size of blocks you'll have to haul out. Three, the cut line prevents cracks from spidering beyond the area you're removing. This is particularly important, say, when you're only removing half of a slab and you want the other half to remain intact. Jackhammers can be fitted with all sorts of bits, each with a specific purpose. For example, you use a wide "spade" bit if you're breaking up asphalt -- the bit is about five inches across. You'll commonly use a chisel bit-- about an inch and a half or two inches across -- on shallow concrete slabs. "Moil points" for designed to break up larger blocks of concrete, and sharp rock points are used to break cement or mortar chinks out of rock walls or patios. Breaker hammers and breaker bits are built to pound straight away, not to pry! A big reason you don't want to pry is because it's possible to bend a bit that has heated up with use. We'll just put it this way -- replacement bits are expensive, and there's no hiding a bent bit when you return to the rental yard. So only use the breaker hammer to break straight away, rather than as a pry bar. This is a particularly thorny issue when working on concrete. Basically, if you drive the bit too deep into the concrete, it can get stuck there. Even if you only get the bit partially stuck, pulling it out of concrete is really, really hard. It's Sword in the Stone kind of work -- and you may not be the one worthy of pulling the bit from the concrete. So a suggestion... when working with cement, follow the cut lines you've made with the concrete saw, and don't drive the tip more than three or four inches into the gap. Work like you're making a serrated edge, with multiple holes in a line. It's an effective way to manage the size of your end-pieces, as well as to reduce the chance you'll get the bit stuck. We're a little obsessive about this, but a clean work area is a safe work area. Even when broken into small pieces, concrete and stone -- even asphalt -- are uneven, heavy and unforgiving. A work area is rife with potential hazards. There's the tangle of the hose feeding a concrete saw, the power cord serving the breaker hammer. And rubble you've created. Add the heavy tools and dense material you're removing, and you have a great set-up for a nasty tumble and hard landing. So clear the work area as you go -- a side benefit of doing so is that you give yourself a break from the heavy work of hammering, which can be sorely welcome.